The SolidWorks plug-in is a custom add-in to the SolidWorks CAD environment which allows users to create embedded electronics on the Voxel8 3D Printing Platform. It is an alternative option to using the Autodesk Project Wire, and caters towards mechanical and electrical engineers who are very familiar with CAD and would like to use a full featured software package for their projects. NOTE: This tutorial presumes you have a basic knowledge of SolidWorks. Before beginning you should first acquaint yourself with this CAD. Inside the product are tutorials, as well as online (if you search). By using this add-in, operators on the Voxel8 Developer's Kit 3D Printing Platform can create volumetric models, and then lay out traces and other component geometries to make 3D printed electronics a reality (see Picture A-001). Picture A-001: The Voxel8 SolidWorks add-in. Note: In this document we use the terms "plug-in" and "add-in" interchangeably. The add-in terminology is specific to SolidWorks. You will need the following to work with the Voxel8 SolidWorks add-in. Follow the instructions below to download & install the Voxel8 SolidWorks add-in for designing parts for the Developer's Kit Printer. The SolidWorks add-in can be downloaded directly off the Voxel8 support site (see Picture A-002). You can download the latest version right here. The most recent version of the add-in as of this writing is 0.5. If there is a newer version, you can upgrade your add-in by heading to the Add-in Maintenance section in this walkthrough. To gain access to the support site, you will need to use the registered account which has been assigned to you. Once logged in you will have access to the plug-in as well as documentation and other support information for the Voxel8 Platform. 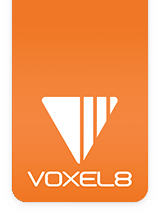 Contact Voxel8 support if you do not have access and we would be happy to set that up. The download is in a zip format, and you will need to extract it in order to use it. Most environments will extract zips by default, but if you need an extractor, you can use any free zip extraction software. Sample examples are WinZip or the 7-zip freeware. Picture A-002 : The support.voxel8.co website. Now that you have downloaded the plugin, you should download the example SolidWorks file that we step through in this walkthrough. You will find it also on the Support site at http://support.voxel8.co/ under the Downloads area. It is called Example1.zip under the SolidWorks sample file(s) listing. Unzip the Example file to a location on your PC, so you have access to its file contents. Now that you have downloaded and extracted the SolidWorks add-in software and the sample file onto your PC, you are ready to install the add-in to SolidWorks. Once the zip has been downloaded and extracted, it's best to explore some of the sample files (See Picture A-003) before installing the SolidWorks plug-in. This will give you a better idea of what is part of the workflow. Picture A-003: Files contained in the zip download. You will note that there are two files enclosed in the add-in zip. We'll describe each of these files in this document and how they will be used. setup.msi - The Windows setup package. setup.exe - The executable you run to install the SolidWorks plug-in. Browse to the unzipped directory containing all the add-in files (see Picture A-004). Picture A-004 - Goto the zip folder location on your drive. Launch the setup.exe Windows Installer program within the folder (See Picture A-006). It's best to run this as administrator. If you have trouble installing the plug-in by double clicking, then right click the setup.exe and install as administrator (see Pic A-007). Picture A-006: Running the setup.exe from the unzipped folder. Picture A-007: Running the setup.exe from the unzipped folder as administrator. The setup will now run through a series of installation screens. You will just need to click through them all (See Pictures A-008 to A-014). Picture A-008: Launching the setup.exe file from the SolidWorks add-in folder. Picture A-009: The Welcome screen to the Voxel8 SolidWorks add-in. Picture A-010: Selecting an installation folder on your PC to store the add-in. Picture A-011: Diskcost information about the space the add-in takes up after installation. Picture A-012: Installing the SolidWorks add-in. Picture A-013: Files are being copied. Picture A-014: Installation is complete. Once you have the Voxel8 add-in successfully downloaded and installed, it's time to move to configuring it with the SolidWorks CAD environment, which is the next step. Launch your SolidWorks, and then from the top navigation bar (see Picture B-001), and select the the add-ins panel(see Picture B-002). Picture B-001: Select the Tools selection from the top navigation bar. Picture B-002: Selecting the add-ins selection from the SolidWorks navigation bar. Once in the add-in configuration panel, locate the Voxel8 add-in which should be located there (see Picture B-003). If it is not there, close SolidWorks, and try reinstalling the plug-in again. Picture B-003: SolidWorks add-ins panel. Now mark the "active" checkbox to enable the Voxel8 add-in (see Picture B-004). This will allow you access to it from within your SolidWorks. If you wish to make it part of your SolidWorks menu, we recommend that you also check the "Start Up" checkbox (see Picture B-005). Picture B-004: The Voxel8 add-in has been enabled and will autostart. Once that is done, just click the OK button button that appears in the add-in tool panel. Now just verify that the Voxel8 add-in appears in your SolidWorks tools menu (see Picture B-005). Picture B-005: The Voxel8 SolidWorks add-in. Congratulations! You should now be able to use the Voxel8 add-in in SolidWorks. If you have trouble installing at any point, please contact Voxel8, or submit a ticket through our support website. You can keep the add-in at the top of your SolidWorks accessible there, or move it to a separate window (see Picture B-006). Picture B-006: The Voxel8 add-in in its own draggable command window. In this section, we will walk you through how to create a simple volumetric printed part with two electronic traces. The component in question will demonstrate the basic workflow structure in the SolidWorks add-in and show the workflow of the tool as it applies to the Voxel8 Platform. Take a look at the model below, as this is what we will be creating in this walkthrough (see Picture C-001). This is a simple custom connector that mates one electrical part to another electrical part through a volumetric print. The large, flat layer underneath the part is for delamination purposes only (see C-001). It also makes it easier to get the part off the Build Plate without using a sharp edged tool. You can skip creating the delamination layer if you just want to print the connector part. Step 17 is where we start to create the actual connector part. Again, the delamination layer is optional in the design. Access the support site and download the Example1.zip file. Unzip it, and then load the Example1.sldprt to inspect it for yourself before creating it in the next steps. Picture C-001: A sample part created from the Voxel8 SolidWorks add-in. Now that you've inspected the part, it's time to design it from scratch inside of SolidWorks using the Voxel8 add-in. Let's get started. Launch your SolidWorks with the Voxel8 add-in installed from the previous steps (see Picture D-001). Picture D-001: New Sketch in SolidWorks. Select the Front Plane, make it viewable (see Picture D-002). Now make the Front Plane normal to the view, so you can easily work with creating the initial model (see Picture D-003). The Front Plane should face up in the z-axis. We want to work in the z-plane because in 3-D Printing we want the bottom of the part to be oriented correctly when we go to print the part, later. Picture D-003: Looking down at the Front Pane. Now the Front Plane is easier to work with (see Picture D-004). Picture D-004 - Top Down of Front Plane. Now that we have arranged a good view, it's time to create our first model on the stage. You always want to be working on the front plane in the SolidWorks add-in (i.e. Euclidean space). Doing so allows you to export parts and then import them into Dashboard at a later step at the correct z axis orientation for printing. Select the Sketch from the top menu (see Picture D-005). Picture D-005: Creating a new Sketch on the Front Plane. Now enter into Sketch mode (see Picture D-006). Picture D-006: Create a new sketch to contain the thin layer of delamination material. Ready to begin the sketch on the Front Plane (see Picture D-007). Picture D-007: Ready to Sketch. Create a Center Rectangle from the Sketch tools (See Picture D-008a and D-008b). Picture D-008a: Create a new rectangle for the material delamination layer on which part will rest for easy removal from the printer bed. Picture D-008b: We are using a center rectangle to make creation easy by dragging to proportions from a center point in the sketch. Now drag out the Center Rectangle from the center point in the middle of the front panel (See Picture D-009). Picture D-009: Creating the delamination layer rectangle on the Front Plane. Drag the rectangle (see Picture D-010) to an amount that is manageable (we'll change the dimensions next). Picture D-010: Rectangle is created within the first sketch. Switch to Smart Dimensioning mode from the top menu and drag the height out (See Picture D-011a). Set to 30mm(see Picture D-011b). Picture D-011a: Sketch is being set to 30mm in height through smart dimensioning. Picture D-011b: Resizing the rectangle to 30mm in height. Now do the same thing for the width of the delamination rectangle (see Picture D-012a & Picture D-012b). Picture D-012a: Confirming 30mm for the dimensions. Picture D-012b: Defining the measurement for the width. Now the delamination layer has been created to a size of 30mm and 30mm (see Picture D-013). Picture D-013: The rectangle has been created and is now ready for some height. The next step is to extrude the delamination layer to give it some height. Select the Feature extrude from the top navigation in SolidWorks (see Picture D-014a), and do a blind extrude in the Z axis up to an arbitrary height (seePicture D-014b & Picture D-014d). Picture D-014a: Feature and Extruded Base. Picture D-014b: Extruding up in Z. Picture D-014c: Extruding the delamination layer in the Z direction to an arbitrary height. Set the height of the delamination layer to 0.19mm which acts as a very first few layers of plastic (see Picture D-015a). You should now have a thin base to print your 3-D part on (see Picture D-015b & Picture D-015c). Picture D-015a: Changing the z height of the extruded delamination layer created. Picture D-015b: a thin 3-D printed delamination layer is now created on which to put our part on. Picture D-015c: Delamination layer has been created (Top View). Now that the delamination layer has been created (See Picture D-016), we'll move onto creating the part that is placed on-top of it. Picture D-016: Starting to add a new base to the existing delamination created in previous steps. Now we move onto creating the base of the printed object we wish to put the electronic trace into. Create a new sketch in your SolidWorks to contain all of this. First, we need to create another rectangle on-top of the first delamination layer sketch object. We create a new center rectangle (see Picture D-017a) and stretch it out in the middle of the previous delamination sketch, but smaller in size (see Picture D-017b & 017c). Picture 017-a: Creating a new center rectangle. Picture 017-b: Creating a new center rectangle by dragging out to arbitrary height and width. Picture 017-c: Dragging out the new base sketch on top of the delamination layer. Now we need to properly size the new base by using the Smart Dimensioning tools. Select the Smart Dimensioning on the new sketch for the base added in the previous step (see Picture 018a & Picture 018b). Picture 018-a: The base is created. Picture 018-b - Smart Dimensioning the new base created. Picture 018-c: Changing the dimensions of the base to 18mm x 12mm for our new part. Picture 018-d: The base part has been changed to 18mm x 12mm in width and height. Picture 018-e: Base has been resized. Now that we have the flat base constructed, we need to make it volumetric, so we do a feature extrude on the base to give it some arbitrary height. Select the base (see Picture 019a). We go into extrude (see Picture 019b), and pull up a base of 0.57mm (see Picture 019c & Picture 019d). Once extruded, the final model should look like Picture 019e. Picture 019a: Selecting the base. Picture 019b: Extruding the base. Picture 019-c: Extruding the base. Picture 019c: Extruding the base upwards into the z direction. Picture 019d: The base has been extruded by 0.57mm. Picture 019e: The final base has been created and sits on-top of the delamination layer. Once the base has been successfully created to the correct dimensions (18mm x 12mm x 5.7mm), it's time to place a center line down the middle from the top down view of the Front Plane (see Picture 020a). This will allow us to more easily extrude more volume to the 3-D printed object. Place the center line in the sketch of the base object you just created. Use the selection tool to grab the right half of the division (See Picture 020b). Picture 020a: A centerline rides down the middle of the base and the delamination layer. Picture 020b: Centerline divides the base into two halves. Now that the centerline has been created we can extrude one half of the base upwards to give our part some depth. Create a new sketch (see Picture 021-a), and create a rectangle on the right side of the base as shown inPicture 021-b. Switch to the Front Plane top down view (see Picture 021-b) and then extrude upwards in the Z direction to give the part some depth of about 6mm (see Picture 021c and 021d). You should have what appears in Picture 021d and Picture 021e when you are done. Picture 021-a: Select the right side of the new sketch. Picture 021b: The right side of the new sketch has been selected. Picture 021c: Start to Extrude that side of the base. Picture 021d: The base has been extruded in the Z direction about 6 mm. Picture 021e: The base has been extruded and the 3-D printed part has some volume. Picture 021f: The 3-D printed part from an isometric view point. Now that the part is extruded and has a sizeable volume; it's time to start working on the vertical traces. First, we select the side of the part as shown in Picture 022a. Then we create a new sketch containing the first vertical plane perpendicular to the Front Plane as seen in Picture 022b. We then create a second sketch containing the second plane adjacent to the first one as seen in Picture 022c, and move it to its correct location in Picture 022d. You should have two vertical planes that intersect the model perpendicular to the Front Plane, as seen in Picture 022e and Picture 022f. At this point you're ready to create the paths for the electronic traces to be added to along the planes that you've generated in this step. Picture 022a: The side of the model is selected. Picture 022b: We create a simple plane perpendicular to the front plane. Picture 022c: A second plane is added to the model. Picture 022d: The two planes are created and positioned correctly for use. Picture 022e: another view of the planes in an isometric form. Picture 022f: Planes extend through bottom of model. Great. At this point it's best to save off your model in SolidWorks. Ready to continue? Onwards! Now that you have created your vertical planes, it's time to construct the lines that follow the contours inside and along the edges of your solid model such that you can route the electronic traces in next steps. Here is how the traces should look when you are done (see Picture 024a). Noticed how the two traces route along the very top of the part, and down below and out. The traces on the bottom of the model do not exit out of the delamination layer. They stop at the bottom of the L shaped geometry at the base of the part. Picture 024a: The part with traces you are working to build. The first step is to select the first plane and draw a center line segment from the very top of the model to the bottom, and then route out to the side as seen in Picture 024-b and 024-c and 024-d. The second step is to adjust the pathway so it is along the top of both places where you want the trace exposed for electronic connections. Picture 024-d shows this with snapping to new locations. Once one centerline is created, we need to replicate the line creation process for the second plane and the centerline drawn along it. In Picture 024-e we show the second line that mirrors the first one created and is adjacent to it. NOTE: For those familiar with SolidWorks, you can use the Convert Entities feature to mirror the other plane and centerline. Finally, in Picture 024h, different views of the centerline traces are shown as they are routed through the part. Examine them in further detail to make sure they look like the same paths as in Picture 024a. The next step will be creating the actual traces using the Voxel8 SolidWorks add-in. Picture 024b: A first center line is generated along the first plane. Picture 024c: Another view of the centerline created. Picture 024d: Side profile of the routed centerline along the top and bottom of the part. Picture 024e: A second centerline has been generated along the 2nd vertical plane and routes from top to bottom. Picture 024f: Two centerlines have been generated successfully along the vertical planes. Picture 024g: More view of the centerlines generated. Picture 024h: More view of the centerlines generated. Now it's time to use the Voxel8 add-in to add the electronic trace along the centerline path that you have laid out from top to bottom of the solid model. Open up the Voxel8 add-in menu, or access it from the top SolidWorks navigation (see Picture 025a). Select the first centerline that you created along the plane, and then hit "Create Trace" from the menu to lay down the generated conduit into the solid body along the centerline that you created (see Picture 025b). Use the default values for the trace that are displayed in the Voxel8 Trace menu. You will also need to select the solid model body to subtract the traces from as in Picture 025c and Picture 025d. Picture 025a: Open up the Voxel8 add-in. Picture 025b: Create the first trace using the Voxel8 add-in. Picture 025c: Creating the first trace on the solid model using the Voxel8 add-in. Picture 025d: Trace is being made via the Voxel8 add-in by subtracting it from the part body. After subtracting the trace from the solid model body you should have the trace inlaid within the part you are designing (see Picture 026a). Picture 026a: The first trace has been made and is shown in outline. Now apply Step 25 to the second routed trace so you have within your model, and subtract it as previously in step 25. You should have what it is shown in Picture 027. Picture 027: Second trace is created, and its outline is shown. Now you should have the two basic traces down within your component (see Picture 028). Picture 028: Both traces have been made successfully. Congrats! You've now designed and created your first model using the Voxel8 SolidWorks add-in. The next step is to export the files from the add-in. Once your model is complete, you'll want to export the .stl files generated so that you can import them into the Voxel8 Print pipeline process. To do this, follow the steps below. In the Voxel8 add-in menu, select the Export to STL selection (see Picture 001). Picture 001: Export to STL selection in Voxel8 add-in menu. Now enter the paths to save off the plastic and trace .stl files to later import into the Voxel8 dashboard service which translates to valid g-code for the Printer (see Picture 002). Picture 002: Exporting the plastic and trace elements to two separate STL files. Once you have completed exporting the .STL files you are ready to analyze to make sure that they were generated properly and will print as you expect them to. Once your .stl files are generated, it is best to inspect the files outside of SolidWorks. To do this, you can use several programs including Autodesk Meshmixer (free), netfabb (basic or private) - See Picture 001, or MeshLab (free) - See Picture 002. We recommend using any of these packages, or you can google search for a very bare bones .stl viewer, of which there are a few available for download. Picture 001: The .stl viewed inside of MeshLab. Picture 002: Same .STLs viewed in netfabb. NOTE: If something appears awry, please contact support to report bugs at: support@voxel8.co. We appreciate screenshots, or logging a trouble ticket at support to help improve our add-in. If your generated STL files look like that they will print well, then its time to move to the next step in the print process: converting them to valid .gcode. Once .stl's have successfully been exported from the SolidWorks add-in, they will need to be run through the Voxel8 Dashboard which inputs .stl's and generates the gcode that the Voxel8 Printer understands. To understand that complete workflow, please visit the separate Voxel8 Developer's Kit Beta Guide that steps you through the process registering an account, uploading stl's, as well as slicing and exporting .stl to gcode. Picture 001: Running your exporting .stl files through the Voxel8 Dashboard. Once your gcode has been output from the Voxel8 Dashboard, it's time to verify that it is correct. You can use any gcode viewer to do this, but the native version of Repetier 1.0.6 (see Pictures 001 & 002) is recommended for an freely available, downloadable tool. Picture 001: The gcode viewed within Repetier version 1.0.6 on a PC. Picture 002: Viewing the slicing within Repetier 1.0.6 on a PC. The Voxel8 Dashboard also has a built in gcode viewer that is under development, so you can use that as well (see Picture 002) to view what the generated gcode looks like before printing it. Picture 002: The gcode viewed within the Voxel8 Dashboard Visualizer. Once your gcode has been exported and you've analyzed the slicing and it looks good, then it's time to get printing on the Voxel8 machine using thermoplastic and silver trace materials. If this is the first time you are printing with the Voxel8 Printer, you'll want to visit the Visual Start Guide. In that section, we cover how to unbox, setup, and print on your Voxel8 machine for the first time. If you are comfortable with the Voxel8 printer and know the procedure of printing, then you can glance over the next steps to glean any new material about printing from the SolidWorks add-in you should be aware of. Now that the .gcode has been created for your sample part, it's just a matter of loading up the part in the Developer's Kit Control Interface for printing. This step-by-step process is covered in the Visual Start Guide. In this section, we'll be printing out the part you have gone through and designed in SolidWorks previously. The basic steps to print are listed below, but for more information on setup and the differences on the Voxel8 Platform please visit the Visual Start Guide available. NOTE: We are presuming that you have already unboxed, setup, and made at least one successful print (FFF) on the Voxel8 machine. There are two methods of printing the part: Touch Screen or via Control Interface. Select the print job that has been sent down by Dashboard onto your printer (see Picture 1). Picture 1: Selecting the Print Job. Hit the Print button (see Picture 2). Picture 2: Printing the Job. Access the Developer's Kit Control Interface either via a locally connected computer via serial or through a remotely located computer via the web control interface. Picture 001: Voxel8 Developer's Kit Control Interface. Select and upload your .gcode file into the Developer's Kit user interface via the Upload tool in the Files section on the left hand size of the user interface. You can drag and drop, or manually select from a file browser (see Picture 003). Picture 002: Loading up the Voxel8 generated .gcode file into the Developer's Kit Control Interface. Picture 003: Browsing for the .gcode file off the location machine you are accessing the Developer's Kit Control Interface from. After uploading the gcode uploaded successfully, it's time to hit the Print Button (presuming the machine is calibrated and aligned for printing silver). Picture 004: Printing a selected .gcode file from the Control Interface. The final output for the test part is in Picture 004, below. Picture 005: The 3D Printed Volumetric Connector. If you need to upgrade or remove the SolidWorks add-in at any point, just click the setup.exe and select the option you want to perform. You'll want to repair when you want to re-install the add-in with a newer version that you download. If you want to upgrade the SolidWorks add-in due to new updates, then simply rerun the setup.exe again and choose to repair the add-in. Inside the Voxel8 SolidWorks add-in folder, click setup.exe, select "Repair Solidworks Addin", and click finish. The add-in will copy over installation files and update from its latest packages downloaded. Picture A-015: Repair (i.e. upgrade) the Voxel8 SolidWorks add-in. Uninstalling the Voxel8 add-in is similar to the repair process. Click the setup.exe and choose "Remove SolidWorks Add-in" (see Picture A-016). Click Finish and the files will be removed (see Picture A-017). Picture A-016: Removing the Voxel8 add-in. Picture A-017: Voxel8 add-in has been removed.